Back in her school days, bored in lessons, she would often take a pencil and drew faces on her fingernails. Those fingers came alive when she started wiggling them. Five fingers, five figures, five characters, a story in her head and a hell of a good time. She rises early and often runs. The wind always blows, the river is never still. Things are awakening in her - characters, stories and a hell of a good time. She is married with three children. The years have hurried by, and children have grown. When silence falls after they have gone to school, she sits down, absorbing the quietness, and writes. Within her, she is once again that wisp of a school girl, with characters on her fingers and stories in her head. Children of Swan: The Land of Taron, Vol 1 by Coral Walker is a science fiction story. Bo, Jack and Briana wake one morning to find their parents have gone, taking all the furniture with them. They are alone. Their father’s ring is in Bo’s hand. All of a sudden, Bo disappears, abducted and, as Jack and Briana follow after him, they fall into a wormhole, arriving in the land of Taron. Taron is inhabited by the Bokwa, a vicious creature that looks like a snake and would think nothing of swallowing a man. The Barans, the people of Taran, catch Jack and Briana and sell them off to a fighting arena where slave boys are put to the fight. Their father is there but he doesn’t appear to recognize them. The contest rules are very clear – there will be just one winner, one survivor of the brutal fight. Can Jack do it? Can he fight to save his brother and sister and get his parents back? Children of Swan: The Land of Taron, Vol 1 by Coral Walker is one of those books that leaves you breathless. Written as a Young Adult Sci-Fi book, it is one of the most engaging books I have read for a long time, a book that swallows you and holds fast until it is finished. It is packed full of action, adventure and drama with no let up from start to finish. I found the characters to be exceptionally well developed and the scene is well and truly set for volume 2, a tale I can’t wait to read. The plot is unique, well told, and is clearly the product of a great deal of work and a vivid imagination. Ms. Walker demonstrates a real strength in her writing, the ability to tell a tale and tell it well, leaving a reader desperately wanting more. I would highly recommend this book to young adults and also to us older adults too as I believe that anyone will enjoy this book and appreciate the hard work that has gone into it. 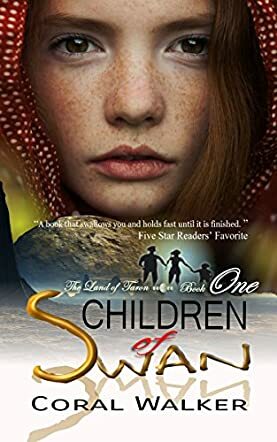 Children of Swan: The Land of Taron, Vol 1 by Coral Walker is a young adult story about quarrelsome siblings who are thrust into an incredible situation. Early in the story, both of their parents go missing and they are left taking care of their younger brother, Bo, and figuring out what happened to their parents. This is followed by Bo being taken to the land where their parents are from, and they discover that their father no longer remembers who they are and that they need to deal with this huge problem by working together. The story progresses from here, gradually introducing a plethora of fantasy elements as we follow Jack and Brianna across this strange world. It ends on a cliffhanger, setting up the second book in the series. The characters are interesting, like the enigmatic Teilo, and we really come to feel for the siblings as they experience this world on behalf of the reader. The action is well-written and fast-paced, and I was able to clearly visualize the story taking place which is a testament to how well-written it was. I think for the right young adult audience this story could be an excellent adventure novella that will entertain and teach. Children of Swan: The Land of Taron, Vol 1 by Coral Walker is perfect for the right audience and has some incredibly beautiful and clever moments contained within it. I can't wait to read more. Children of Swan by Coral Walker is the first book of the series The Land of Taron. Taron, located on the faraway planet of Cygnore, was once peaceful under the glow of a single yellow moon, but the birth of a second moon, blue in colour, transformed the planet into one of hatred, fighting and chaos. The fiercest battles came from inhabitants of the Kingdoms of Bara and Rion. When a Baran prince and a Rionean princess disappear during a duel, the narration ends and the tale begins. After their parents vanish, leaving behind their father’s ring bearing the image of a snake and a swan, sixteen-year-old twins, Jack and Brianna, and their four-year-old brother, Bo, are taken to a social services accommodation facility. Shortly after their arrival, the social worker, Ms Upright, picks up a sleeping Bo and flees to a car outside. Jack and Brianna give chase, with Bo emitting an ear-piercing, glass-shattering scream, enabling their escape. The twins take control of the car, which puts them to sleep and takes them to Isle of Skorpias. When they wake, it seems like they are back in their own house, but it is just a replica with a few differences. Inside the house, they discover the laboratory where they were conceived. What an amazing story premise. I was transfixed on every page of Children of Swan and impressed by Coral Walker’s ability to keep the story so action-packed and full of surprises and twists at every turn while, at the same time, keeping everything flowing smoothly. No detail was overlooked and the characters were very engaging. The story's delivery was top-shelf quality and I look forward to the next book in the series.